Follow the entire 2018 season at Galletta's Backyard Karting Speedway from every camera angle and every lap from our complete YouTube videos! Also, each individual race has its own page with the video, driver names, race results and point standings below. In addition, please let us entertain you by navigating our massive website, as we have virtually every single race in its entirety at Galletta's Greenhouse Backyard Speedway (from mid-2005-2018 seasons) and Oswego Kartway (2007-2008 seasons), and even some Klassics before that. Enjoy! Unedited video footage from the 2018 edition of our annual 200-Lap event. Matt Stevens wins his 13th (of 23) Annual Galletta’s Greenhouse Karting Klassic Championship Races! Sunday, August 26th, 2018 – In our neverending mystery that has been the last two seasons (either several 1st timer rookies show and no vets, a couple of vets show and no rookies, OR nobody at all), we had two vets show up and one rookie. Due to a late start (Chris and his wife got back from work and had to do a few things before they could join the race and record–one reason why we plan on switching to Saturdays after today). Brian Galletta got some nice shots, which we uploaded as well. POINTS, VICTORY PICTURE AND EDITED VIDEOS COMING SOON (work, kids, kids’ school, seasonal events, not enough free time the past two weeks) but enjoy the unedited video here. Sunday, August 19th, 2018 – Several rookies raced in a heat and a 40-lapper. With enough drivers, two vets could join for points (although perhaps they should not have, as a familiar face started 3rd and dominated after 2nd place blew a tire and 1st place had a sputtering engine, making it a relatively easy win for someone that you can probably guess who they are if you know our races or just keep scrolling through our history). POINTS, VICTORY PICTURE AND EDITED VIDEOS COMING SOON (work, kids, kids’ school, seasonal events, not enough free time this past week) but enjoy the unedited video. Race video and points are not done yet, but when it is, it’ll show up here. Sunday, August 12th, 2018 – For the 2nd week in a row, we had track and karts ready to go early–but unfortunately, only two drivers showed up, so we had a makeup race. More here. Sunday, August 5th, 2018 – In an unfortunate twist, most of our regular drivers could not make it, so due to only three visiting drivers, we rescheduled to a “Make Up Points / Rookie Race” — although you can’t keep Matt Stevens off the track and races with no points or feature wins at stake. Chris Stevens took the opportunity to try and get a wide variety of different shots, not just the tower angle which everyone who knows us is accustomed to. Enjoy it here! Sunday, July 29th, 2018 – Another year, another Harborfest champion has been crowned. Little do most people know, we see who is the champ of the Oswego gathering annually on our track on the outskirts of Oswego. It’s top secret… except it’s only been on this website every year since 2005! Two 8-lap heats and a 40-Lap feature were up for grabs for 10 competitors, and it was good, hard racing (with a few mishaps)! More — including complete race videos and point standings — can be found here. Sunday, July 22nd, 2018 – Twin features on a loose and bumpy track were on tap, and both were exciting as usual. 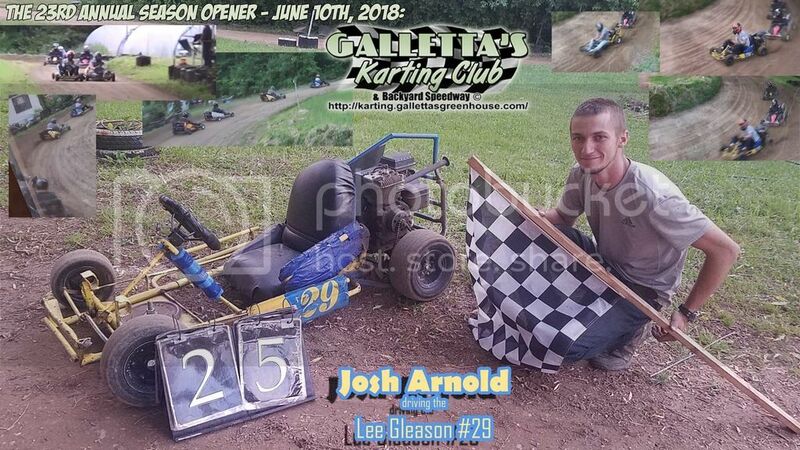 Matt Stevens was able to successfully navigate the low groove to sweep both features, although he needed two karts to pull off the 2nd one when his Team Galletta’s Greenhouse #33 stalled with a clogged carb early on. Fantastic race action in both! Video, points and more coming on this below page. Sunday, July 15th, 2018 – Due to race video, points, and karts not getting done during the week, Matt and Chris sat out this event, making it a make-up points / rookie bonus race. (We usually don’t take victory pictures for makeup races, but maybe we should, since it makes nice cover photos for the website.) Steve Sixberry led the entire show until getting loose in turn 4 when he slid a bit too high, enabling returning veteran Kevin Galletta to execute a pass and take the win. This makes for the 1st time the #43 kart has won a feature since it was re-numbered from its original number–the former Brian Galletta #13! Race video and full race info here. Friday, July 6th, 2018 – Hooray! We finally got enough people for a race! Kelly Miller recovered from an early wreck and capitalized to pass two karts to take the lead when he boxed in Chris Stevens on sputtering Eric Woolworth on a late race restart to take the win. Unfortunately, our usual camera person was recovering from a c-section and another declined (although they demand their way in every circumstance–including alter the rules and editing the website in favor of them). This meant two stationary camera angles and lots of editing with an expensive program was needed before you get a halfway decent video, and a newborn’s dad doesn’t have the most free time. Points and video may not be finished before next weekend’s race (and because I have a problem with this, the races are being threatened to get shut down and drivers are losing patience with it). UPDATE: Race video and points are finally finished! Please go and watch the unedited race video from two angles on this page here. Thursday, June 28th, 2018 – Doug Didero–Oswego Speedway Hall of Famer (three time Oswego Supermodified track champ, two time Oswego Super Classic 200 winner and 9th all time in Oswego Super Feature wins), not to mention a veteran of many other forms of racing, (including NASCAR Busch, IRL, and more)–stopped by to watch a 3 kart exhibition by Kelly Miller, Matt and Chris Stevens. Chris and Matt have been fans of Doug since the early 1990s and finally got him up to check out our big backyard speedway as Kelly was able to pull him and his car owner away from his Super for a bit to check it out. He loved it and wanted to see 10-15 karts out there! (We wholeheartedly agree! Where have the drivers been?) Sorry for no video… our usual camera woman was preparing for an early morning c-section and another declined. NOTE: Kelly was saddened that he had to leave before we got a picture in. No race next weekend, as Chris Stevens and his wife Rungnapha (the usual tower camera woman) welcomed their second daughter–Celeste Nicha-Bella Stevens–to the world on Friday and were in maternity all weekend. Next weekend’s race is up in the air. Club racer/co-founder/webmaster/statistician/video producer Chris Stevens will be welcoming his 2nd daughter to the world this weekend (with his wife–and usual camera woman, Rungnapha “Aou” Stevens). Due to this, we may not be able to have a race. It really is a wait-and-see approach. Chances are we will have to either skip the week’s race, schedule one mid-week, or if all else fails, just have another makeup race. We literally do not yet know. When we do, we’ll post it. Now, remember: We race every Summer Sunday and Fall Saturday unless we do not have enough drivers (minimum is usually 6, and we have a max of 20). Sunday, June 10th, 2018 – Well, our 23rd Season Opener at Galletta’s Greenhouse Backyard Speedway occurred. And Josh Arnold continues his impressive ways of the last three years (two time defending Visitor’s Points Champion) and won (driving his father-in-law’s #29; his #93 was still in need of repairs for breaking during last year’s Klassic 200). Josh again is looking like the top visiting driver and also looking at being the 1st driver in our history to knock Matt and Chris out of their 1-2/2-1 perch on top the point standings for all 22 prior seasons. But it’s kind of easy for the top three drivers in the past two seasons when nobody else has the balls to show. Enjoy other seasons at Galletta’s! There are HUNDREDS to choose from with endless HOURS of complete season videos! are these karts available for rental, and how much? Yes, there are around 20 karts on site, most of which sit idle every race night. Most (but not all) are available for rent–which is a bare bones gas-and-parts use fee that does NOT cover anything else, and only people with no understanding of how much abuse the karts think it’s not worth it. Buy your own kart to race anywhere and see it’s much, MUCH more. Most nights, a a 1st-timer will need a little practice, a heat and a feature (30-50 laps most nights), which would be around $25-30 depending on the length of the race. Veterans usually are kinder on the karts, and can race a little cheaper. Season finale 200-lapper is a little more, but still such a ridiculous deal, we offer $100 to any person who can find a 200 lap/20 mile motorsport race cheaper anywhere. Now, remember, it’s all money that goes directly into the karts. Gas, tires, engine maintenance, oil, chains, whatever the kart needs, that rental covers it. Usually the track absorbs the electricity, water, welding, and gas needed for track maintenance. And head mechanic and track operator loves racing so much, he does it completely from the love and passion of the competition… he gets ZERO money for his labor. None. Zip. Nada. And a few times where people stiff Matt, he’s out of Christmas money. So, be kind and respectful to him and hell, give him money for gas, parts AND a generous tip… he is the whole club.